Another one of our sweet hounds has gone on to the Rainbow Bridge. Sandy Hendricks, who adopted Rush, called to tell us that she had to put down her beloved greyhound Rush. Rush turned six years old in August. Sandy adopted Rush from our group in May of 2006. 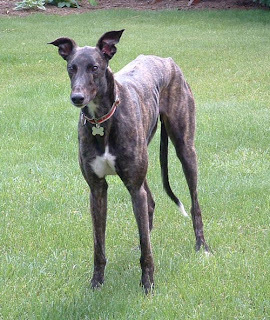 At the time she had two dalmations and heard how great greyhounds were. We brought Rush to her and he became a wonderful family member. He did well until recently when he started getting sick. Several trips to the vet did not reveal the source of his problems and he appeared to be getting sicker. She called and we talked about him and from what she was describing, it sounded serious. She made an appointment and took him to another vet. But before much could be done, he got so sick that this new vet felt that his kidneys had failed and he had to be put down. Sandy is broken hearted. She came to our picnics with Rush when we had them and it was always great to see this sweet boy. I know that he will be greatly missed. God speed Rush. You are pain free and happy running at the bridge.